You are currently browsing the category archive for the ‘Happy’ category. Things go around. I have been micro-blogging on Google+ for the last two years. I really enjoyed the interaction there and made a few really good friends, several of whom I’ve met in real life. Google+ is going away in a week. I’ve had a lot of time to mourn it’s passing, so it will be anticlimactic when the date finally comes. I’m not porting my posts. I’m not sure if I’ll start blogging here again. I feel like a blog is just yelling into the void these days. Does anyone read these anymore? I don’t want to return to Facebook, and while Twitter and Instagram are fun, they really aren’t a place to post personal stories. I’m still biking and hiking and now I’m skiing and dating. Everything is going really well and my anxiety is mostly under control. Exercise has always helped, but things I’d like to do, like meditation, I have a hard time concentrating on…because anxiety. So I started taking CBD oil, and it could be a placebo affect, but I’m sleeping better, I’m not letting things bother me as much, everything is so much easier. I still get anxious, but a manageable and maybe even a normal amount. Today was Race Your House, where liveaboards race the sailboats they live on. They can bring crew along and claim handicaps and Raven got the highest handicap of them all–250. I have no idea what that means, except that we are slow. We started out okay. We got our sails up and started making the calculated tacks and jibes that keep you close to the starting point. Those soon went awry as the wind failed to keep us going fast enough to finish our tacks and jibing around would cost us too much distance. Finally we went towards the breakwater too long trying to get up speed and ended up having to turn on the engine in order to not hit the rocks. Beep! we hear our starting horn and boom: we’re disqualified for having our engine running after the start horn. We contemplated doing the race anyway, but decided that trying to get around the committee boat was going to keep posing a problem. We decided to go ahead and sail along the route and watch, turning back when we got close to Bainbridge Island. It was a very slow, straight sail. We chatted, ate and told stories, then we jibed for the return. It was uneventful, but fun and chill. Raven will not be participating in Race Your House next year, but maybe we can crew on someone else’s house. Click on the photo to see more pics of the event. Raven has her masts and sails now, but isn’t quite ready to hit the Sound. We’re all chomping at the bit, to mix my genres, to get out on the sea. Just a couple more weeks! 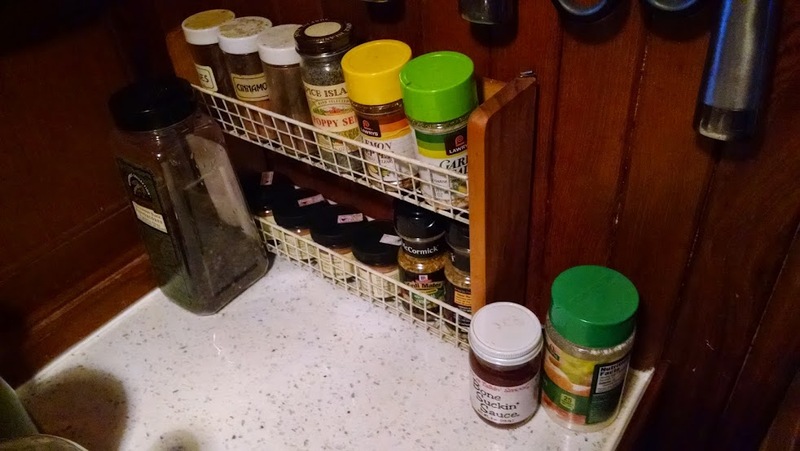 There are 5 containers of cinnamon in this rack. Five. Hopefully I can keep this thyme and sage alive for a little while. So we can keep things nice and tidy. 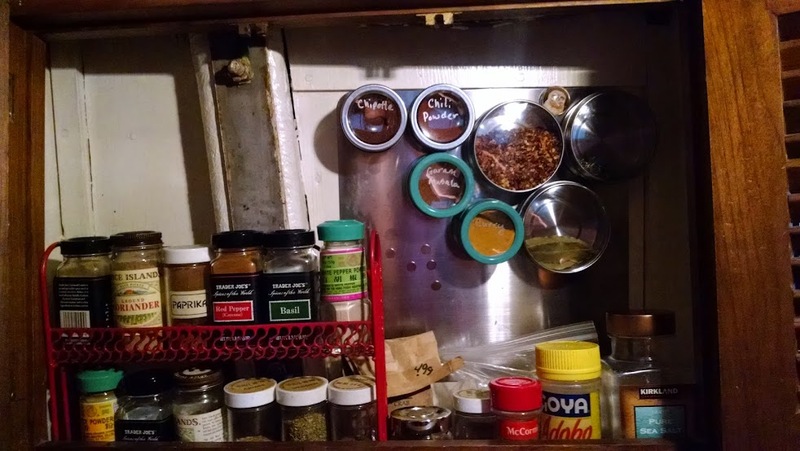 I plan to find more metal that magnets will stick to that is the right size to fit in the nook behind the red spice rack. Chris says he knows someone that can cut it for me. I’m finding that the magnets from the containers magnetize parts of the metal sheet in there now and make it so other magnets are repelled because of the polarity. Anyone know if there’s a trick to that? Thicker metal? Braining the folks that adhere the magnets different ways on different containers? I went for a run yesterday and was surprised by my stamina. It might have been the magnificent view. Click on the photo for more photos from my run. We had a few friends over for lunch today and we started talking about my friend’s recipe challenge and sharing recipes. It made me think about my messy ivy patterned recipe box and my online Drive folder where I have my most used recipes. I really need to finish switching those recipes over to Drive not just to save clutter, but to make them easier to update and share. As the rain of winter continues, perhaps I’ll use all my free time (only a little sarcasm) to put those recipes up. We moved on the boat officially last Saturday and we got a few days in without anything interesting happening. There’s a lot of condensation, so we ordered some small quiet dehumidifiers. They don’t really work though, so we need to get a bigger one. Occasionally the breaker would flip, so we have learned how much we can power at the same time. Then, the freeze came. The temperature dipped into the 20’s and has been hovering there since Saturday morning. 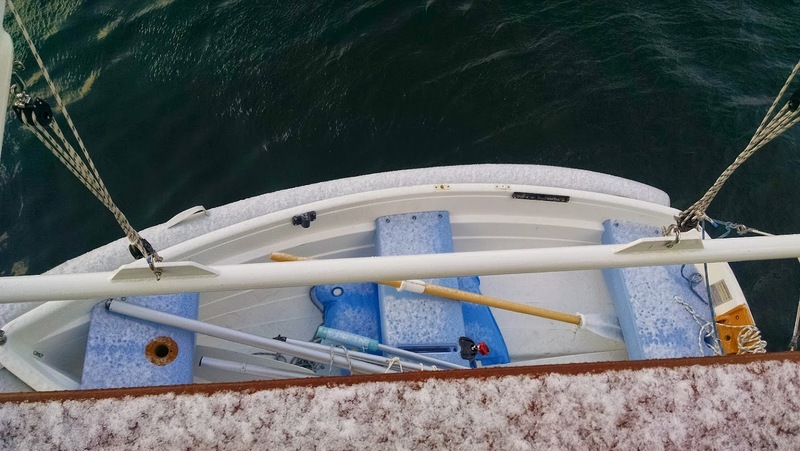 There was snow in my dingy! Click through for more snow pics. The propane to the stove stopped working, so I figured that the tank was empty and I figured out how to switch tanks. It turned out that something else was going on, but I still feel accomplished. On Sunday, when leaving to pick up the crew at the airport, I had a frantic moment when I thought I had locked myself into Raven. 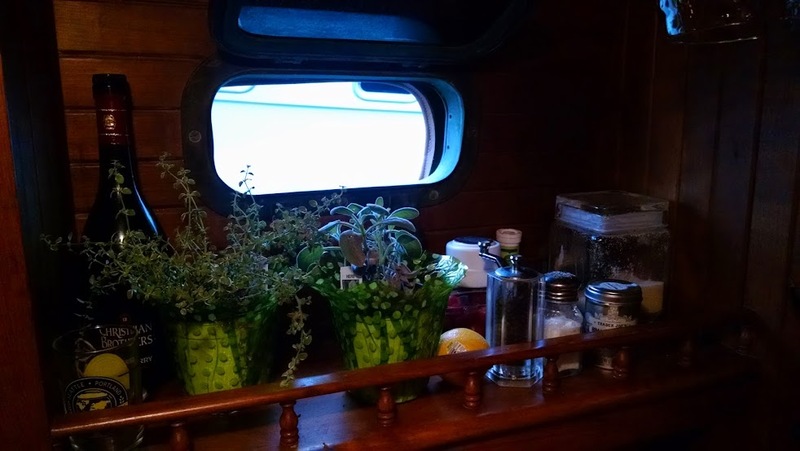 It was so windy the night before that the swinging doors would not stay closed, so I put in the panels and slid the hatch closed. In the morning, the hatch was stuck and there was no way to remove the panels since the hatch covers the opening where they slide out. Finally I got enough friction to move it. What a relief! Then I went to scraped the windows and heat the car, but when I got back in the door would not close. You can’t drive a car with the door unsecured. Finally that fixed itself after much pushing and pulling of mechanisms and locking and unlocking of the doors. We had our first visitors that night. First our friends that also moor at Shilshole stopped by to see Raven and say hello. Then some of my family came for dinner. It was a challenge to cook everything in the right order, but I think that it went pretty well, and only 20 minutes behind schedule. I made black cod with basil cream sauce and green bean and cauliflower casserole. I’d also successfully made french bread that day to accompany. Then yesterday, the water pump wouldn’t stop running, so we had to turn off the power to it whenever we weren’t using it. Chris went and got a new one and put it in and water is now running smoothly again. One thing about plumbing on the boat, everything is a lot simpler than it is in a house. This morning the breaker kept tripping, even after we went around and turned off everything unnecessary. I finally ran into our neighbor on one of my trips to the breaker and he told me it was happening to him as well, so probably something with the overall power rather than something with the boat. It makes us look forward to wind and solar power. I just had to add a quick post because Raven is arriving today after a brief hold up in Redding California due to construction on I-5. She has been decommissioned and I feel that I should share the pictures we got of that from the broker, as it is kind of awesome to see a sailboat without it’s mast or rigging. I don’t think I’ll make it down to see her until Friday, but it’s pretty exciting to know she’s here. Oh, and if you’re in the market for a beautiful Gulf 29′, check out this page. Enough with all that negative stuff. Summer is going great. We’re having a lot of fun giving out books and signing kids up for the Summer of Learning. The teen program is less fulfilling, but I still love giving teens books and for right now we still have some to give, so that is wonderful. The sign up for two of my teen programs are filling up. We have an Arduino program and a Digital Fabrications showcase planned. The rest of the summer is filled with drop-ins where teens can use our region’s new iPad mini to make digital content for our Tumblr or just make something fun with the supplies I will put out. In reading news, I just finished the yummy new book by Scott Westerfeld that’s coming out in September, Afterworlds. A longer review will come in the next few days. I got to see The Boy for dinner and a movie on Sunday. I took him and The Mister to see The Fault in Our Stars and it got all three of us sniffling (sorry to out you guys, but I saw you crying! :) It is a truly wonderful adaptation of the book. The Boy’s been waiting for his new job to start and the date keeps getting pushed back. It was great to see him. I wish he was closer or interested in working in Seattle. In my biking, I’ve had 2 chains break–on different bikes–in the last month. I guess I’m just hard on them, as they both still showed signs of life when I checked them at the co-op. I’m picking up Lucile (Bike Friday Tikit) tonight after work. I had her looked over to make sure there wasn’t anything else major I was overlooking. I’ve been riding my Surly while she’s been in the shop. I have to say that bike repairs are much more affordable than car repairs were. I certainly don’t miss that. Nathan ended up with a better childhood than you would think, what with being the son of a black witch and a white witch in a world where white witches rule. Only one of his siblings hate him and the sanctions aren’t that bad. Until one day they are; Torture and imprisonment become Nathan’s life, despite the fact that he’s done nothing wrong. It brings into question whether “white” is in fact equal to “good.” Nathan makes it through his time with his tormentor and escapes to find someone who can help him reach his full birthright as a witch. Half Bad is dark and often depressing, like the later Harry Potter books. Also like the Harry Potter books, the plot twists will keep you reading and the magical world will intrigue you. Nathan is a worthy, complicated character learning not to judge a witch by their color, including his dark father. There are many good things about this book. The writing, the friendships, the depiction of high school for a normal student, relationships in a divorced family, some racial diversity without calling it out. Nell and Layla have always been close. For younger sister Nell, the relationship has bordered on obsession. Layla is growing up and becoming detached from her younger sister and while Nell is trying to let her go, she’s worried. Soon we find out there’s a good reason to worry. Nell is also growing up and starting to do things on her own, with her own personality and activities. She’s trying to be supportive of her sister, but something is just not right. When Layla finally confides in her, she keeps the secret but knows she shouldn’t and it puts a lot of stress on her. Nell makes a decision and does something about it rather than allowing a bad situation to go on until its natural conclusion. I like this because it shows teens that doing something hard will not end their world. A couple of things that distracted me: dead brothers as advisers, student teacher romance seemed a little cliche, the “we’re so connected I thought we shared a name” thing, that their parents were always giving them money. Nothing I couldn’t get over though. Fans of realistic fiction will love this book.